Summer is a good time to advertise to women golfers. There is a lot of national publicity for PGA and LPGA events that will raise the awareness of golf and that will reinforce your local advertising. For moms, summer is good because high school babysitters are easier to find which will allow moms a few hours on the range or course for a couple of hours. For working women, corporate golf events are underway and motivation to learn and play golf is high. Here are some basic rules to guide your advertising to women. 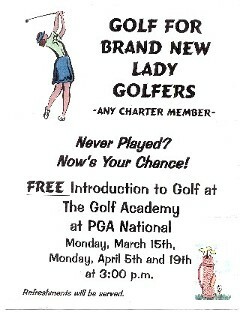 Rule 1: Include a photo or drawing of a female golfer. Because the golf industry is dominated by men, unless an ad very clearly targets women, women may not think the advertising is for them. A picture of a woman golfer (or something “feminine” such as flowers) is worth a thousand words. Trust me! With digital photography it is very easy to produce a photo of women golfers for newspaper advertising. Take a photo of one of your women clinics or women on the fairway. Use a throw-away camera and develop into digital prints or use your digital camera. Convert the image to black and white, increase background and decrease contrast and you have a great soft background for your ad, Most local newspapers, will overlay your text message on your photo, or you can do it yourself with one of the many photo software programs. Rule 3: Include the beginning time and ending time of the program. It’s not good enough to say 1 pm because women won’t know how long the commitment is. (Note the opening flyer -- it doesn't say how long it is -- could be 30 minutes or 3 hours!) The shorter the time period the better because women (whether working or stay-at-home moms) are very busy. Drive the point home: If the lesson is from 1 to 2 in the afternoon, also say, “One Hour.” If you are offering a special 9-hole program, say “Two Hours” and make sure you can deliver a two-hour experience on your course. The view that women are “slow” golfers is really a myth. In addition to lots of other reasons, most women are simply too busy to drag out a round. Rule 6: Provide free rental equipment. (A Demo-Day is great!) Text should read: no golf equipment necessary; clubs provided. If you don’t have some 7 irons, putters and 5 or 7 woods around, invest in some. Rule 7: Offer value. Women are good shoppers and recognize value. In addition, women are hesitant to spend big bucks on a game that they may not like. So, provide affordable programs and think about packaging group lessons with private lessons; or lessons (or buckets) with rounds of golf – anything that makes it a good value. On-course group playing lesson – just for one or two holes. ….and many more that are described in Women Welcome Here! A Guide to Growing Women’s Golf. Click Here for information. Of course, once the women are at your facility, the challenge is to make sure that the staff and course are women-friendly. To see if your facility is women-friendly, check the Best Practices Tab on this website. You should have about 75% of the best practices that are applicable to your type of facility. Use the FREE HELP LINE , to ask Nancy about your advertising. You may even attach a draft to your email or fax it.